Home/cubicle extenders/Can Cubicle Wall Extensions Stop Workplace Wars? Can Cubicle Wall Extensions Stop Workplace Wars? OK, the special effects in this video are a little over the top – people don’t really explode from being hit with a foam bullet. However, guns of any kind are usually a bad idea in the workplace. It’s fine to take coworkers out for a bonding event at the local laser tag center. Just make sure they get rid of all their weapons before they reach the office door. If your office is really trying to “go green”, the last thing you need is people using paper for making pointless (yet surprisingly pointy) stuff to throw at each other. Higher cubicle panels make launching a strategic air strike more difficult. 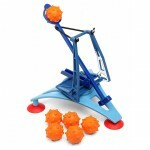 ThinkGeek is all agog over this classic Roman style siege device. They admit that the primary purpose (really, the only purpose) of this kind of toy is to annoy one’s coworkers. Technically, this weapon might have enough power to lob a spiky foam cannonball over a tall cubicle divider. But the chances of actually hitting someone go way down when you can’t see what you’re aiming at. Do You Understand the Noise Problem?